It is really what you would call German 120mm clones, L44 in American inventory is called M256 built under license. The list of countries that use this gun is long. 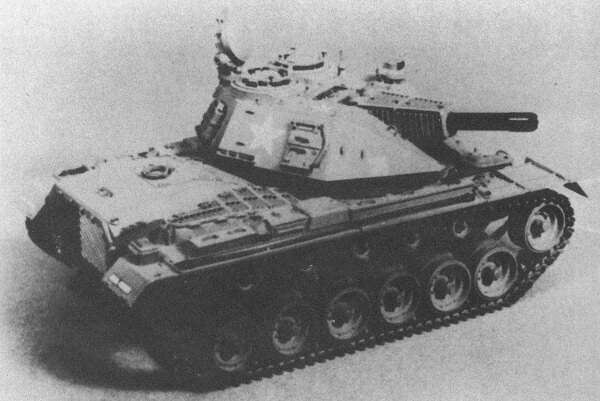 The French went their own route design with the 120mm, designation for theirs is called CN120-26 with a barrel length of 52 calibers. 125mm designation 2A46M series is also cloned by many countries, the most promising version would have to be the 2A46M1 with a barrel length of 47 calibers. I should also add that Russia does offer a low pressure 125 mm with the designation of 2A45M, their new Sprut vehicle is sporting this. One 125mm that is also worth mentioning would be the Ukrainian KBA3 125mm serving on Ukrainian T-64s thru T-84s,Pakistan also uses this gun on AL-Khalid and T-80/84. Some would debate that this gun is better than the Russian one. What makes the 125mm at this time not on par with 120mm actually has to do with KE projectile performance, the Russians and Ukrainians are at their limits in projectile length due to auto loader size, I will bet we will see in the future a bustle mounted auto loading system mounted on Russian tanks because of this, it already has been tested and can be retrofitted to T-90 series. I don't really know that I would draw that big of a distinction between the L55 and the M256 (which isn't really the "American 120mm and it's clones" since it's actually just the Rheinmetall GmbH L44 which is NOT American designed). Yes, the L55 has higher peak velocities but they retain the same ammunition and geometry. I think refering to these systems as just "American", "Russian", "British" and "German" doesn't take into account how much these weapons have changed over the years, and their employment. I mean, refering to the L30, the L11A5, the Swiss CV90120 main gun, the L55, L44, the GIAT CN 120-26 (Leclerc), the M103 heavy tank main gun (120mm), the Merkava Mk-4 IMI 120mm, and the KBM2 120mm on the Ukrainian tanks as similar just based on their 120mm ammo? That would be like comparing the M16/M4, the Famas, the G36, the L85, the M249, the Mini 14, the AK 101, the SCAR L, Keltech SU-16, and the Galil just based on their 5.56mm ammo. Both comparisons would be misleading and nonrepresentative of the facts. Don't let the calibre fool you, there's a bit more goin on here than you make out. L55 is basically a stretched out L44 so that Tungsten projectiles can be launched at higher muzzle velocities nothing more, Germans are out of the DU business. Its funny that they needed to resort to this when they have already designed a muzzle brake to fit the L44 and also lower velocity 105 and 120mm mainguns, all in the name of safety for close proximate ground pounders, the noise and cost factor can be debated. KBM2 is actually a system that was initially designed for Poland T-72 and PT-91 series tanks, Ukrainian and German influence was used to help assist Poland in possible upgrades to T-72 due to dense budget issues and NATO ammo compatibility, we pretty much know what happened to this project, it went bye bye because of dirt cheap LEO2A4 sales, the Ukrainians still felt that they had a glimmer of hope with this upgrade and offer it as a export package, they will stick it out using KBA3 on T-64 and T-80 series tanks. And yes, all mainguns and projectiles should not be treated equal even though they are of the same caliber family. My bad about calling the M256"American" You guys are ofcourse right it was a German gun to beguin with. On the other hand, taking your own example, the Galil, M16, G36 etc are very much comprable. So are most of the 120mm guns fitted to MODERN tanks. Whats the great diffrence between the IMI 120mm and the M256? AFAIK they fire the same rounds and have similar performance. This dosent include the British rifled gun and ofcourse I did not mean 120mm guns from 50 years ago like the one fitted to the M103. You would compare the Galil and M16? I wouldn't, they are almost nothing alike. The Galil is almost completely taken from the AK family of weapons, so in what way are you suggesting they are comparable? They have different sights, controls, gas systems, magazine interfaces, bolt design and recoil spring placement. You definately lost me on that one. "Very much comprable"? The only thing they have in common is ammunition, which was exactly my point. Another thing to consider is that different countries use different rounds, so differences are there regardless of calibre. The shape of things to come on Russian and Ukrainian tanks, universal turret that can be fitted to both T-90 and T-80 series tanks. I should also add that this turret configuration will also allow a Crows crew served weapons type station. It is not the small 5 mm that make the difference. The change in power comes from the shell which is entirely different, as well as the barell material and turret shape, thickness and material due to metal harmonics from the blast. The ergonomics of the controls change the shot too, with the gunners ''tossing'' the shots. 19kilo30K4, so the SABOT and MPAT rounds are essentially squeezed down as they travel through the tube? OK, that makes sense ... if for gas-sealing alone. "I would think there would have to be a limit on how large you could make a HEAT round and still hit a moving target at distance since they are not the most aerodynamic thing out there and fly like a brick." Yup, I said this above. "would [it] be possible to mount the GAU-8/A Avenger gun of the A-10 Thunderbolt in a tank?" That would be hysterical! Still, I would think you need a number of 30mm hits to take out an MBT, so you have to get into position and expose yourself longer to squeeze off an effective burst. And then, with a dotted line in the sky pointing back at your position, everyone within 15 miles would know where you were. While a tank such as you envisioned would be entertaining in a videogame, one precision shot from a larger tube makes more sense in the real world of armored warfare.